One of the truly great pre-war Cambridge crews: the Light Blues pratising at Chiswick for the 1936 Boat Race: cox J.N. Duckworth, stroke W.R.M. Laurie, 7 J.H.T. Wilson, 6 D.W. Burnford, 5 M.P. Lonnon, 4 D.G. Kingsford, 3 G.M. Lewis, 2 H.W. Mason and bow T.S. Cree. [He] was one of those rare men who will always be remembered by everyone who ever met him. He had enormous charisma, great strength of will, but above all dedicated his life to the needs of others. I hesitate to write about him as I fear that I cannot do justice to such a remarkable man. I am also embarrassed by the fact that I have only recently heard of him. In an age of ‘celebrities’ there is not one of these well-known figures who is fit to be mentioned in the same breath as (John) Noel Duckworth. 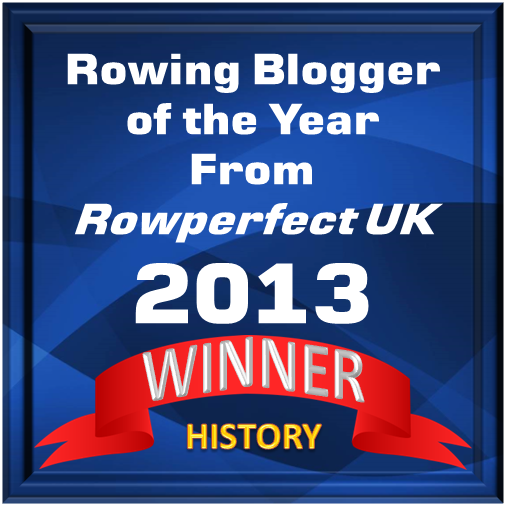 JND: … I started rowing in Jesus College in ’31 when I went up. When I went out as a freshman I knocked 10 foot off the end of a boat and sank the crew (I won’t tell you what they said). I was charged ten pounds for mending it so I stayed on in the boat club to get my monies worth. Interviewer: How did you progress from sinking boats to coxing winning boats? JND: A loud voice, a certain amount of bluff and always been there when you are wanted and never been put out by various disasters – which many came my way. Interviewer: Are there many small conflicting things in a crew and the men around a crew? Cambridge in the 1930s was a good place for rowing. Between 1920 and 1936 the Light Blues lost only one University Boat Race. Further, CUBC had such giants of the rowing world as Ran Laurie and Jack Wilson. In 1934, Noel was chosen to cox Cambridge in the Boat Race of that year. Film evidence is here. It was perhaps the best crew of the era and they won easily, beating the course record by 26 seconds with a time of 18 minutes and 3 seconds. 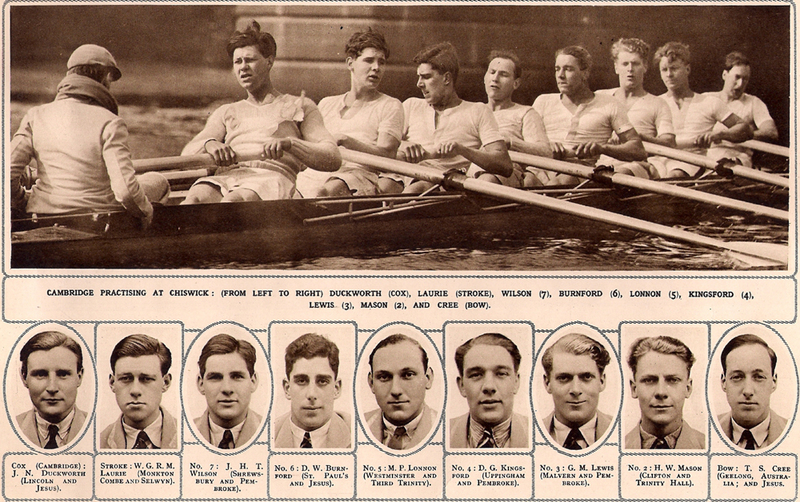 At Henley three months later, Noel steered Leander to victory in the Grand Challenge Cup and, on the same day, Jesus to victory in the Ladies’ Plate. A annus mirabilis indeed. Now ’36 was interesting… the (Irish Republican Army) had been putting bombs all over the place… and they actually put one on Hammersmith Bridge… Now this is entirely fictitious but it makes a very good story… We thought that if the IRA were going to demonstrate their loyalty by blowing up Hammersmith Bridge then we thought that Oxford should be the recipient of this token of their loyalty and so they went through Hammersmith Bridge ahead of us by half a length but just after Hammersmith we put on a spurt … and we left them in about twenty strokes and won by five lengths, but not in a good time. See for yourself here, here and here. 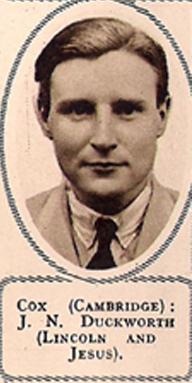 Noel was the obvious choice to cox the British eight in the 1936 Berlin Olympics. The crew were all Cambridge men save two from ‘the other place’. In the final they were placed fourth behind the USA, Italy and Germany. Writing later in The Cambridge Review, Noel probably unjustly blamed himself for the crew failing to make the first three. He held that his steering in the first heat meant that they had to get to the final via the repechage and were thus unduly tired. The more likely reason was that, as he himself stated, the crew was a ‘patched up affair’ who had trained to peak at Henley rather than the Olympics. There are brief glimpses of Noel in the official film of the race and on the YouTube version he can be seen from 2 minutes 32 seconds and from 3 minutes 38 seconds. 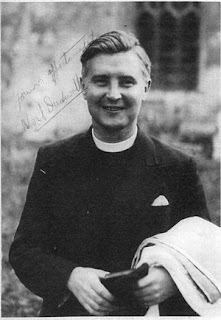 Ordained in late 1936, Michael Smyth says that at Noel’s first parish, ‘His energy was immediately apparent, attendance at services grew and various societies were revitalised’. [Noel] stayed there and when the Japanese… would have slaughtered the wounded, this little man flayed them with such a virulent tongue that they were sufficiently disconcerted to refrain. They beat him up very cruelly for days, because they did care for being verbally flayed… but they did not kill the wounded men he had stayed behind to protect… This little man with the rosy cheeks and the cheerful grin and the mop of hair like a small boy’s eventually brought (the wounded) to the comparative security of (Padu Goal in Kuala Lumpar). His name is Padre Noel Duckworth. It is a name that thousands of Australians, Englishmen and Scots will always remember until the day they die. When Noel was captured with the wounded soldiers one of the doctors who had also stayed behind attested “I firmly believe that Noel’s fame as a rowing man saved all our lives” because a Japanese officer recognised Noel. This story is given some credence by the fact that a Japanese crew from Tokyo University participated in the 1936 Berlin Olympics, as well as Henley prior to that, so it is likely that Duckworth was known to them. Furthermore, of the Japanese Divisions used for the invasion of Malaya, one ‘the Imperial Guard’ traditionally recruited its officers from Tokyo University! Duckworth was one of those small men with a giant personality. The skill which he acquired in getting the best out of his oarsmen by exhorting, cajoling, and if need be, verbally castigating, he later employed during the bleak years in (prisoner of war camps) both to sustain his fellow prisoners, and to extract those small concessions from the Japanese guards which were so vital to survival. The Padre perfected the art of selling broken, worthless pens, watches, lighters etc. to the Japanese guards and the money received went straight to local traders for food for the prisoners. The guards would fall for his soft honeyed tones… but in reality his words, although sweet sounding, were calling them all kinds of unflattering names… To men who were very ill, starving and dying, his mixture of courage and comfort, defiance and deliverance, humour and understanding all made up the necessary essence and spirit which the men needed and clung to when at their lowest ebb. 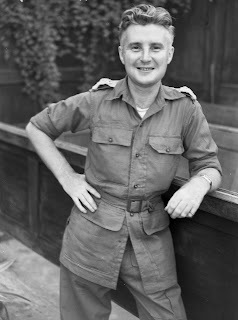 After the fall of Singapore to the Japanese, Noel was moved to Changi Gaol and in 1943 was sent into Thailand and Burma on the construction of the notorious Burma Railway. There he tended hundreds upon hundreds of men dying from disease and starvation. Over 90,000 Asian civilians and 16,000 Allied POWs died in the building of the railway. On the completion of the railway, Noel again chose to stay behind with those judged too ill to move back to Singapore, his indomitable spirit having the same inspirational effect on the men to that which he had at Padu. He was one of the very few who lived to return to Singapore in April 1944. 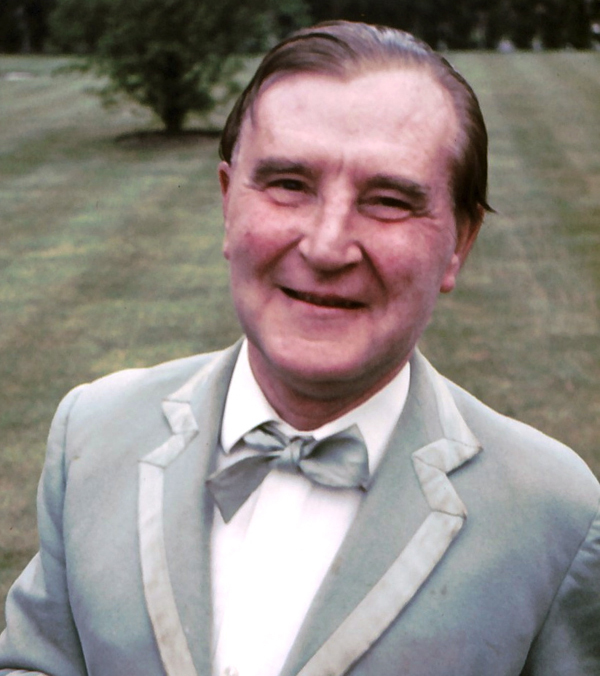 Noel Duckworth was a marvellous man who almost killed himself doing good… I loved him for what he did to raise morale and for his lovely sense of humour and for just being himself. A picture that Searle drew entitled ‘Padre Noel Duckworth selling a Parker pen to a Japanese guard’ is here. It was created as a gift to mark Noel’s appearance on ‘This is Your Life’, and was autographed by all those who appeared with him. His men sought some little solace in cigarettes, which they had to make themselves. Bible pages were ideal for this purpose and the soldiers asked their chaplain for permission to use them. Duckworth assented with the proviso that they read every word on the pages first. At the end of the war Noel made what was to become a famous BBC broadcast ironically entitled ‘Japanese Holiday’. It was the first detailed account of the horrors of the Far East camps that many people had heard and the talk was subsequently printed and widely circulated. It turned out that Noel was also a natural broadcaster and for three years he joined John Snagge in commentating on the Boat Race. 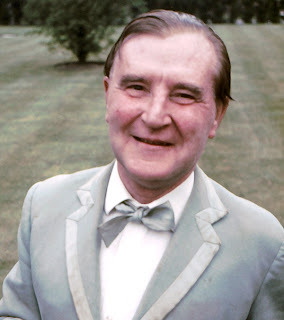 He was the subject of an edition of the ‘This is Your Life’ television programme in 1959 (a picture of Noel and Roland Searle on the show is here) and in 1961 he was invited to appear on the iconic BBC radio programme ‘Desert Island Discs’. More formal recognition of Noel’s wartime achievements came in 1946 when he was twice ‘mentioned in despatches’, retrospective bravery awards for ‘gallant and distinguished service while a prisoner of war’ and ‘in recognition of gallant and distinguished service in Malaya in 1942’. Surviving nearly four years in a ‘living hell’ did not blunt Noel’s sense of humour or his sense of fun, nor did it diminish his love of life or love of his fellow man. From 1948 until 1957 he lived in the Gold Coast (now Ghana) where he helped to establish the first university in that country (‘a Cambridge of the tropics’). Characteristically, he went beyond his ‘job description’ and worked tirelessly to set up a charity providing free schooling to local children. Although his health had been severely undermined by his years as a prisoner of war, he seemed indefatigable as a coach of all comers on the towpath of the Cam, seemingly a perpetually enthusiastic adolescent on what passed as a bicycle, yet transformed into a wise counsellor and a friend in his rooms in College. J. Hamilton: Rowing was his lasting love and through his enthusiasm, knowledge and encouragement, many men at Churchill experienced… the meaning of physical endeavour and team spirit with the rewards that follow. A. Ramsay: He was capable of almost apoplectic excitement and regularly cycled into the river during races’. Noel died on 24 November 1980. In his 68 years he had seen the worst that man can do to man, but he still retained his faith in humanity, his sense of humour and his love of life. It is impossible for me to do justice to the life of Noel Duckworth in 2,000 words. The best I can hope is that I have done a little to raise awareness of a great man. Fortunately, Michael Smyth (who knew Noel during his time as a student at Churchill College) has written his biography, Canon Noel Duckworth: An Extraordinary Life (ISBN 9780956391766). It will be published in September 2012 and can be ordered from the Development Office at Churchill College. Its 44,000 words should start to give some due honour to a truly remarkable man and a truly remarkable life. Thank you for this wonderful article about a wonderful man. Never heard of him before, he should be more known. Thank you Bob, I obviously agree. Hopefully when Michael's book is published it will raise public awareness of Noel's life. I have contacted a friend of mine who produces TV documentaries and she agrees that it is a programme waiting to be made. Unfortunately things move very slowly in television production and good projects often come to nothing while banal subjects fill the airwaves. I read this article as the result of reading the book The Boys in the Boat by Daniel James Brown. While the mention of Noel Duckworth is brief (pages 322 and 323), it was sufficient to want to read about this amazing person. I am looking forward to reading his recent biography. It's the Royal Canadian Henley! 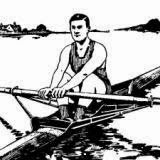 Olympic Rowing? No, thank you! It could have been Six Games! ‘Bert And Dickie’: Drama Or Farce? Rowing And Politics, A Good Mix? A Silver Or A Bronze Or The Potato Medal?